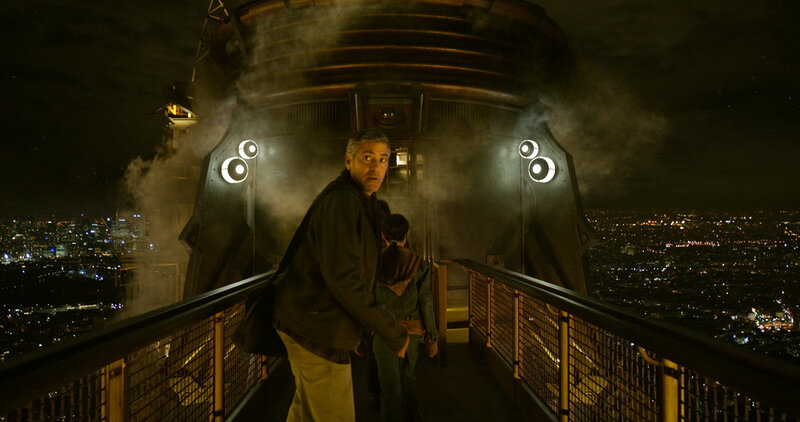 Disney raided it’s own theme-park and created a movie event in the form of the “Pirates of The Caribbean” franchise, could it possibly do the same with “Tomorrowland”? We first meet “Frank Walker” (George Clooney) recounting his story straight to the camera, he is constantly interrupted off camera until the tale is enlivened following suggestions from a female voice. Young Frank (Thomas Robinson) attends the World fair in 1964, his Jet Pack invention is rebuffed by the judge “David Nix” (Hugh Laurie) but sparks the interest of his daughter “Athena” (Raffey Cassidy). Young Frank leaves after Athena has gifted him a special “Pin”, which ultimately allows him access to a special world. A land filled with optimism, wonder, futuristic visions and everything he ever dreamed of. Cutting back to the off screen voice, we switch to the present with the story recounted in real time from the perspective of head in the stars “Casey Newton” (Britt Robertson). Casey is the daughter of soon to be unemployed NASA engineer “Eddie” (Tim McGraw), as the local rocket launch site is gradually dismantled. Casey likes getting into trouble and after one such visit to the local police station, she notices a “Pin” allowing her access to the same fantastic world. Attempting to find more information about her discovery only leads her into more danger, with rescue arriving from an unlikely source. The story leads Casey to “Old Frank”, the one character who really knows what the alternate world represents but Frank is initially unwilling to help. The film directed by Brad Bird is a whirlwind of colour and cinematic invention, ideas and spectacular visuals all thrown at the screen with wild abandon. This works reasonably well until half way through the running time. After a younger viewer skewed start, the film unexpectedly kicks up a gear, becoming “Terminator for the under 12’s”, these scenes are by far the best in the film. However, following a spectacular escape to a ridiculously clichéd setting, the story loses structure and momentum, dissipating the tension and interest built to that point. Clooney brings his usual on screen presence but adds nothing new to his repertoire, Robertson and Cassidy do well but Laurie gets little on screen time or any chance to make an impression. The closing reel is a complete mess, the writers seemingly bereft of ideas on how to end the film. The themes of the story represents a diametrically opposed world view of most modern films, seemingly obsessed with an apocalyptic vision of mankind destiny. Presenting the future as bright, collaborative, clean and largely harmonious, which differs rather depressingly from the current world view. One could argue the general public do not buy into this message, which has contributed to the film becoming one of the biggest box office disappointments of 2015. With a budget of $190M there is certainly plenty to see on screen but audiences stayed away and it’s not difficult to see why. The film swerves uneasily between differing tones, real life primary coloured Jetson’s one moment and baseball bat versus robot head the next. It is difficult to identify what the target audience was, too young for teens but too old for younger viewers. An environmental message is also front and centre, again a worthwhile message albeit lost within the flashy visuals and confused narrative. Not as bad as some critics might suggest, with many visual splendours and wonders to behold. But the muddled storyline and inconsistent tone, contribute to a major disappointment bearing in mind the talent and budget available. An ambitious yet heavily flawed project that dares to soar but falters badly as the story takes flight. Honest Movie Reviews, News, and Commentaries!